The Barton family, the current owners of Chateau Langoa Barton are able to trace their Bordeaux roots all the way back to 1722. That was the year that Thomas Barton left Ireland and made his way over to Bordeaux. Like many successful owners, Thomas Barton started out as a Bordeaux negociant, or wine merchant. The first foray into ownership for the Barton family was in St. Estephe, with Chateau Le Boscq in 1745. The family continued being active in not only buying and managing Bordeaux chateaux in the Medoc, but as successful wine merchants. They eventually partnered with another powerful Bordeaux family to form a massive Bordeaux wine negociant company, Barton & Guestier. Founded in 1745, the firm of Barton and Guestier is still active in the Bordeaux wine business today. The next major purchase in the Left Bank for the Barton clan took place in 1821. 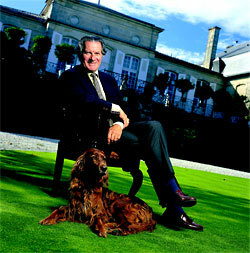 That was the year they bought their next Saint Julien estate, Pontet-Langlois. Shortly after the sale, they renamed it, Chateau Langoa Barton. Following the purchase of Langoa Barton, they bought a second, St. Julien estate. Culled from the vineyards of Leoville Las Cases, that estate became Chateau Leoville Barton. Interestingly, because no cellar or wine making facilities came with the purchase, they were forced to make both wines at Langoa Barton. In time, the production of both wines taking place at Langoa Barton became a tradition. 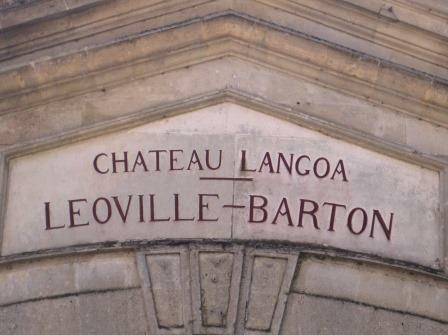 In fact, when you look at the label of Leoville Barton, the chateau on the label is actually Langoa Barton. Chateau Langoa Barton has another unique distinction. Out of all the 1855 Classified Growths, it is the only chateau that is still in the hands of the same family that was an owner at the time of the classification. 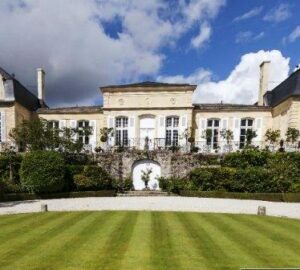 Today, Chateau Langoa Barton is managed by Anthony Barton and Lilian Barton. The style of Chateau Langoa Barton is quite different than that of their other estate, Chateau Leoville Barton. A large part of that of course has to do with their vineyards and their location in the St. Julien appellation. The vines for Langoa Barton are due south of Leoville Barton, with a north by north west exposure. The majority of their vines are close to the center of the Saint Julien appellation. Because of that geographic different, the Langoa Barton vineyard gets less sun. Langoa Barton is in a cooler terroir as it is closer to the center of Saint Julien. The 25 hectare St. Julien vineyards of Chateau Langoa Barton is planted to 57% Cabernet Sauvignon, 34% Merlot and 9% Cabernet Franc. Similar to what has taken place at Leoville Barton, over the years, the percentage of Merlot has been increased. Although, it is interesting to note that the Barton family feels there are some Petit Verdot vines in their as well. The vineyard of Langoa Barton has a terroir with gravel and clay soils. On average, the vines are 35 years of age. While they do own older vines, generally speaking, they are often replaced by the time they hit 40 years of age. The vineyard is planted to a vine density of 9,100 vines per hectare. The vineyard parcels are close, but not contiguous. The vineyards, which are all inland, are placed into 5 main blocks. Those blocks are then divided into more than 15 separate parcels with vines not far from Chateau Leoville Barton, Chateau Leoville Poyferre, Chateau Ducru Beaucaillou and Chateau Beychevelle. The wines of Chateau Langoa Barton are traditional in style and as such, the vinification is traditional as well. The wines are traditionally made in large, 200 hectoliter wooden vats. Malolactic fermentation takes place in vat. To be more precise, at Langoa Barton, they try to induce co-innoculation, which is what takes place when the alcoholic and malolactic fermentation occur at the same time. The wine of Chateau Langoa Barton is then aged in an average of 50% new, French oak barrels for about 20 months. On average, close to 7,500 cases are produced of the traditionally styled Chateau Langoa Barton each year. There is a second wine, Lady Langoa. The Barton family also own Chateau Mauvesin Barton, in the Haut Medoc appellation, and a popular, negociant company, Les Vins Fins Anthony Barton. The best vintages of Chateau Langoa Barton are: 2018, 2017, 2016, 2015, 2014, 2010, 2009 and 2000. Sadly, I have very little experience with much older vintages of Langoa Barton. But, due to its classic style and often tannic profile, my guess is that truly older vintages are worth taking a chance on in the auction market. Chateau Langoa Barton is not a wine to drink on the young side. The wine is usually far too tannic, and austere during its youth. Young vintages can be decanted for an average of 2-4 hours, give or take. This allows the wine to soften and open its perfume. Older vintages might need very little decanting, just enough to remove the sediment. Chateau Langoa Barton is usually better with at least 10 years of bottle age. Of course that can vary slightly, depending on the vintage character. Chateau Langoa Barton offers its best drinking and should reach peak maturity between 12-15 and 30 years of age after the vintage. Langoa Barton is best served at 15.5 degrees Celsius, 60 degrees Fahrenheit. The cool, almost cellar temperature gives the wine more freshness and lift. Chateau Langoa Barton is best served with all types of classic meat dishes, veal, pork, beef, lamb, duck, game, roast chicken, roasted, braised and grilled dishes. Chateau Langoa Barton is a perfect match with Asian dishes, hearty fish courses like tuna, mushrooms and pasta as well as cheese. Sizzling and zesty with crunchy cassis, sages, cedar and peppery aromas popping up easily, this full-bodied wine is concentrated, fragrant and dripping with olives in an intricate finish. Give this a decade and it will sing. Produced from Produced from a blend of 54% Cabernet Sauvignon, 38% Merlot and 8% Cabernet Franc, reaching 13% alcohol. Classic, crisp, tannic and concentrated, the wine is packed with dark red, zesty, fresh fruits. The tannins are soft and the forest floor, cedar, and tobacco scents pair perfectly with the juicy cassis. Full bodied, crisp, bright and crunchy, the tobacco leaf and cassis make a great pairing. The tannins are ripe, firm and constant, letting you know this needs age, and it's going to be worth the wait. The finish delivers lift and energy in its classic profile. Bursts of tangy little currants, a cedar wood fire sends out smoke plumes of cassis scented tobacco into a damp forest, leading you to a polished, fresh, bright, crisp and crunchy blast of red berries. The finish offers length and lift in a classic style. From a blend of 55% Cabernet Sauvignon, 37% Merlot and 8% Cabernet Franc, the wine reached 13% alcohol. The harvest took place from September 20 to October 13. Firm, structured, classic and fresh, with a vibrancy to to the sweet cassis, herb, cedar and tobacco notes. The wine is full bodied, concentrated and offers a spicy cassis and cedar character. This should age quite well over the years. Fresh, vibrant and crisp, with a cassis, tobacco and spicy character, this is coming along quite well. A supple style of Langoa, with polished tannins, round textures and ripe, dark, blackberries that stick with you from start to finish. With a bright, sweet and tart, spicy, tangy, red berry, medium bodied, accessibile personality, with a shot of espresso in the nose, this will be best in its youth. There is a strictness to this classically styled wine that could soften with age, as the crisp blackberry and tobacco tinged wine develops. Earthy, medium bodied, slightly rustic, with crisp, peppery, cranberry and cassis flavors, the wine is a little tough in the finish. From a blend of 73% Cabernet Sauvignon, 17% Merlot and 10% Cabernet Franc, the wine is packed with lively, spicy red and black fruits, earth, coffee and tobacco. This bright, tannic wine needs time to develop and soften. At least a decade or more is required. Fresh, bright, crisp and juicy, as expected, this is still youthful. The tannins are present, but they are soft and ripe. The fresh has a bite, and the finish leaves you with fresh red fruits, earth and spice. Another few years in the cellar will add more softness and complexity. From an assemblage of 60% Cabernet Sauvignon, 30% Merlot and 10% Cabernet Franc, this tannic, fresh, bright, cassis and red berry filled, classic Bordeaux wine needs time to develop. Full bodied, with some tannins still to be resolved, the wine offers a classic character, with bright, crisp, red berries in the nose and mouth, freshness and a crisp, juicy, earth herbs, and cedar note that adds to the bright cassis. This is already starting to display its earthy, cedar wood, tobacco, cocoa and blackberry charm. Much open and accessible that I would have expected. A nice wine, and a good value for a Classified growth. Ready to go, this medium bodied, bright, crisp, crunchy wine has a definite overtone of greeness, better known pyrazines. You're going to need to like a true classic styled Bordeaux to dig this. Tobacco, cassis and spicy aromatics are easy to find. The wine remains youthful, tannic and firm demanding either a very long decant, or several more years in the cellar. Cassis, earth and tobacco poked through the wall of tannin with effort. This tannic, masculine, old school style of Bordeaux wine demands at least another decade before opening up. Approachable with its medium/full bodied, fresh, red berry charm, the wine is fresh, crisp and bright, finishing with ample tannins amidst the buckets of fresh picked cherries in the finish. The austere personality and slightly drying, tannic finish did not make it a winner for me. Leafy, minty, cassis and spicy aromas lead to a crisp, crunchy, cassis finish. Licorice, earth, tobacco, blackberry and cigar notes open to a soft wine that has developed rapidly. The end note is a bit dry in the otherwise, warm, black cherry finish. Firm and still tannic, and showing more ripeness than many other Left Bank wines in this vintage, this masculine styled, youthful wine is starting to offer secondary characteristics with its tobacco, smoke, wet earth, cedar and peppery scents. Hold off for a few more years and this should be an even better wine. Drinking well at this time, there is a freshness, brightness and crisp quality to the dark red fruits, coupled with a medium bodied, slightly tannic palate presence. An hour or 2 of air will add a lot to the wine. This powerful, masculine, tannic, St. Julien wine offers cigar box, earth, creme de cassis and blackberry scents in the perfume. Solid, chewy and still youthful, this concentrated Bordeaux wine is well suited for fans of traditionally styled wine. High-pitched, medium-full bodied, bright, crisp and pepper, with a strong, cedar and leaf notes on top to the sweet and tart, peppery cassis. Masculine, tannic and beefy, this old school styled wine offers a lot of bright cassis, olives, leaf and tobacco along side the slightly gruff, tannic finish. In time, this could be more interesting, but I think it's always to be more apealing to fans of the style produced in Bordeaux a few decades ago. Medium bodied, firm, lean, crisp wine that is much better on the nose than on the sharp, cranberry and cassis palate. Drink up as this is not getting any better. Classic in style, the wine is a bit firm in character. The earthy, tobacco, cedar and cassis nose is a bit more interesting than the bright, crisp, full bodied, slightly hard palate. There is an herbal note in the earthy cassis driven finish. Lovers of more traditional Bordeaux will probably like this even more than I did. Stern, rough, rustic, austere, old school styled wine with more cranberry than cassis, with a lean to the cedar, herbal, bright, acidic, peppery side as well. Tasters with a strong affinity for how things were, in the early 29th century will like this more than I did. The wine is full bodied and loaded with dark, red fruits, tannins with some rusticity and a great nose of tobacco, cedar and sharp, red fruits. The finish is long, with a firm edge to the sweet and tart red berries. Quite the classic charmer, with its cedar, tobacco, spice and sharp red fruit nose. Medium bodied and quite fresh, but not overly acidic on the palate, age has added a lot of nuance to the wine. Perfect with a late summer grilled fare. Classic old school Bordeaux, but in a good way, There is a firm, slight austerity to the wine, but that does not take away from the earthy, cedar, cherry, tobacco and cassis charms. Fully mature, but well stored bottles could even age for several more years. Frankly, I liked this more than the 1982 Leoville Barton! Decades past its last breath of life, there was no fruit remaining, just acidity and some spice. Still, it was amazing to find a wine this old in my glass.